SilverLining Designs - Interior Design and Textile Design in Mississauga, Oakville, GTA. Not only will SilverLining Designs help you achieve the home interior you desire, but we will also provide you with the most exquisite items for yourself, family and home. SilverLining Designs is passionate about design and we want to help you create beautiful interiors for your home. We are here to meet your needs, however small or large your design concerns are. We will work with you to achieve the look you want. Whether it's to provide custom made drapery and window treatments, consult on paint colour or material finishes, or freshen up your tired furniture by re-upholstering or custom fitted slipcovers, we are happy to provide the help you need to pull your decorating together. Looking for the perfect bag to carry or apron to wear, a gift to give or something to spruce up your home? 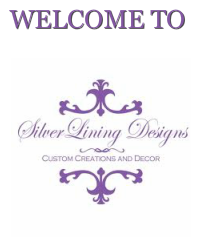 SilverLinining Designs offers that and more with its unique collection of handcrafted items with eye catching original designs that will be a pleasure to give and to receive!